Community Infrastructure Levy (CIL) is a new mechanism by which developers contribute to funding the critical infrastructure required for the new homes they build, and POW very much welcomes the introduction of CIL as a positive step towards funding much needed infrastructure throughout the Borough. At its Executive meeting on 10th April Waverley Borough Council submitted its ‘CIL Draft Charging Schedule’ for examination by an Inspector, but surprisingly proposed a ‘zero CIL rate’ for the current development at Dunsfold Park, and what is more, for all future developments on the site. This means that Waverley Borough Council has not only given away the chance of receiving the £10m to £14m that CIL would have generated from Dunsfold Park now, but also of ever receiving CIL monies that future Dunsfold Park developments would raise. The Council has ignored all requests to reconsider its last minute CIL proposal. Using figures recently quoted by the Council Leader herself, Julia Pots, this sum of money could, for example, be used to fund improvements in local infrastructure such as 1400 council house refurbishments, or it could contribute to almost a quarter of the identified funding gap for Transport Infrastructure across the whole Borough. So the developers make huge profits and we rate payers are left financing the significant infrastructure upgrade requirements? When are the next council elections? Do we have a list of those councillors who voted for the development? Yes, you are correct. The infrastructure improvements that the developers are paying for are not going to make a difference much beyond the environs of their site. The spine road will enable the vehicles to leave the site. The new roundabout will be to allow those vehicles to join the A281. There is widening and revision of the roundabout at Shalford, and some traffic light re-phasing works in Bramley. On balance this is not going to reduce the impact of the extra volume of commuter traffic and commercial vehicles as they attempt to get to the nearest rail links (Milford and Witley 8 miles away) the A3 at Milford, or try to navigate through Guildford and find the A3 there. Andrew Bolton, Cllr Mike Hodge, Cllr John Fraser. Note: the use of stand-ins in this meeting was later the subject of a Judicial Review as the vote broke the Council’s own constitutional rules. That JR was withdrawn after WBC admitted the mistakes. You can see the video of this meeting and it demonstrates that many Councillors expressed unease at passing the Local Plan but they felt forced to vote to approve it. This is unbelievable. WBC certainly need to explain their reasons for this decision which will only benefit the developers . This is clearly brilliant news for the developer, he must be delighted. But for the rest of us, it looks utter madness. I commute from Witley where there are usually no car parking spaces after 11am – a similar story in Milford and Godalming. The rail company have no plans, or land, to build more. How will they cope with such a massive increase in commuters? This sets aside the fact that the local schools are full, the surgeries are full…. 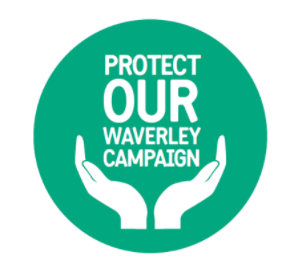 I suspect Waverley just expect people to cope – it’s why we pay them millions. I am astounded that our councilors can act in a way that gives away so much for virtually nothing. Do they still think they represent the interests of local council tax payers? Eleven years ago we had the support of Jeremy Hunt and Ann Milton; where are they now? Ann Milton is still a supporter of the cause. Jeremy Hunt has had a more permanent seat installed on a fence. He has flip flopped on the Dunsfold issues and has never stood up to be counted. What he does behind the scenes is another matter.